This article presents a new test prototype that leverages the 3D printing technique to create artificial particle assembles to provide auxiliary evidences that supports the validation procedure. The prototype test first extracts particle shape features from micro-CT images of a real sand grain and replicates the geometrical features of sand grain using a 3D printer. The quantitative measurements of the particle shape descriptors reveal that the synthetic particles inherit some attributes such as aspect ratio and sparseness of the real materials while exhibiting marked differences for sphericity and convexity. While it is not sufficient to consider the printed particle assembles a replica of the real sand, the repeatable manufacture process provides convention tools to generate additional data that supports the validation procedure for particulate simulations. Oedometric compression tests are conducted on a specimen composed of the printed particles of identical size and shape to create benchmark cases for calibrating and validating discrete element models. 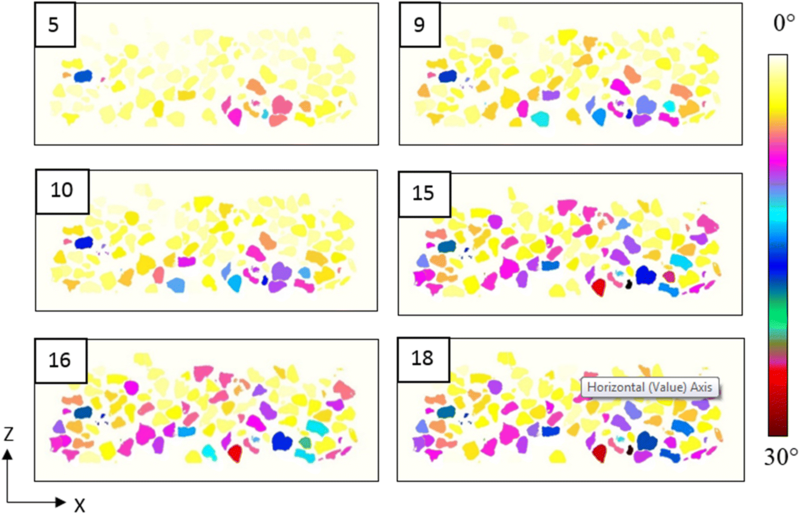 Results from digital image correlation on the synthetic sand assemblies reveal that the fracture and fragmentation of the synthetic particles are minor, which in return makes particle position tracking possible. As our prototype test and research data are designed to be open source, the dataset and the prototype work will open doors for modelers to design further controlled experiments using synthetic granular materials such that the individual influence of each morphological feature of granular assemblies (e.g., shape and size distribution, void ratio, fabric orientation) can be individually tested without being simultaneously affected by other variables. We thank the two anonymity reviewers for the constructive suggestions and feedback that leads to improvements of this article. This research is supported by the Earth Materials and Processes program from the US Army Research Office under Grant Contract W911NF-15-1-0442 and W911NF-15-1-0581, the Dynamic Materials and Interactions Program from the Air Force Office of Scientific Research under Grant Contract FA9550-17-1-0169, the nuclear energy university program from department of energy under Grant Contract DE-NE0008534. These supports are gratefully acknowledged. The views and conclusions contained in this document are those of the authors, and should not be interpreted as representing the official policies, either expressed or implied, of the sponsors, including the Army Research Laboratory or the U.S. Government. The U.S. Government is authorized to reproduce and distribute reprints for Government purposes notwithstanding any copyright notation herein. To investigate the grain rearrangements and porosity reduction phenomena at the microscopic scale, discrete DIC (cf. Ando et al. , Hall et al. , Tudisco et al. ) with image interpolation, has been performed on reconstructed image stacks of printed particle specimen at different stages of applied strain. In the DDIC process, firstly, each particle in the image stack representing the initial state of the specimen is labeled and named as reference image stack. The relative position all other particles in image stacks representing different strain levels are then calculated via a particle tracking algorithm called TomoWarp2 (cf. Tudisco et al. ) developed in laboratory 3SR. The output results (displacement and rotation in all of three axial directions) are recorded in a spreadsheet for all particles in the specimen at different mechanical loading stages. Figure 8 presents vertical displacement (Z direction) map obtained for 6 different stress states of the specimen (as presented in Fig. 6b) through a color pattern of the image slice cut through the middle of reference image stack (see Fig. 6a). The intensity of the color represents the relative movement of a particle in a particular stress state to that of in reference image stack. 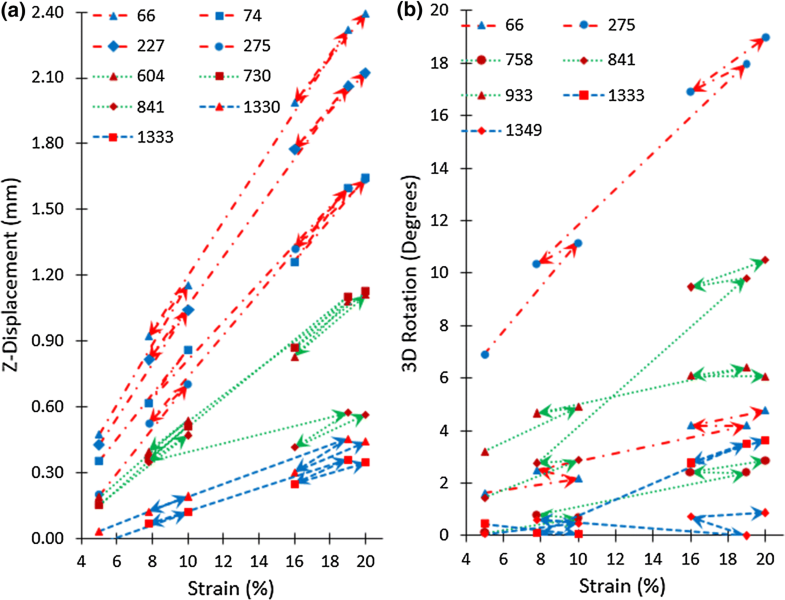 These 6 stress states are representative of particle position in (a) low strain level (scan 5), (b) loading/unloading at small (scan 9 and 10) and higher strain levels (scan 15 and 16) and, (c) high strain level (scan 18). Notably, since the concept of DDIC presents the relative position w.r.t. the reference image; therefore, all image slices in Fig. 8 are of reference image where different color intensity is representative of vertical displacement at mentioned strain level (via scan number). At the first glance, this color map shows the significant movement of particles present near moving the piston (bottom layer). The movement is further shifted to middle and then top layer particles in due course of mechanical loading. This behavior resembles that of the theory of stress distribution in granular material and thus justifies the potential of particle tracking technique as well as of the synthetic material for such mechanical investigations. However, DDIC results showed some error as the negative displacement of higher magnitude for grains present in top and bottom interfaces. This observation is again due to “search window” error for some grains present in the interface . Following a similar guideline, the 3D rotation measurements for the printed particles were made using the same strategy of DDIC (cf. Andò et al. ); providing data for each grain’s rotation in all three axes (as a rotation vector) w.r.t. the reference image stack. The norm of these three rotation vectors was then calculated to represent 3D rotation. Similar to Fig. 8, the color map for same 6 stress states for 3D rotation has been presented in Fig. 9. The color intensity of each particle represents 3D rotation calculated as “norm” of rotation vector in all three directions. The color map does not exhibit any traceable trend for the 3D rotation. However, the particles in the bottom layer are rotating more at the low strain levels whereas bottom and middle layer particles rotate significantly at the higher strain states. Top layer particles are merely leading to any sort of rotation. Further, the particle movement trends presented in Figs. 7 and 8 do not indicate the onset of deformation band or material bifurcation. 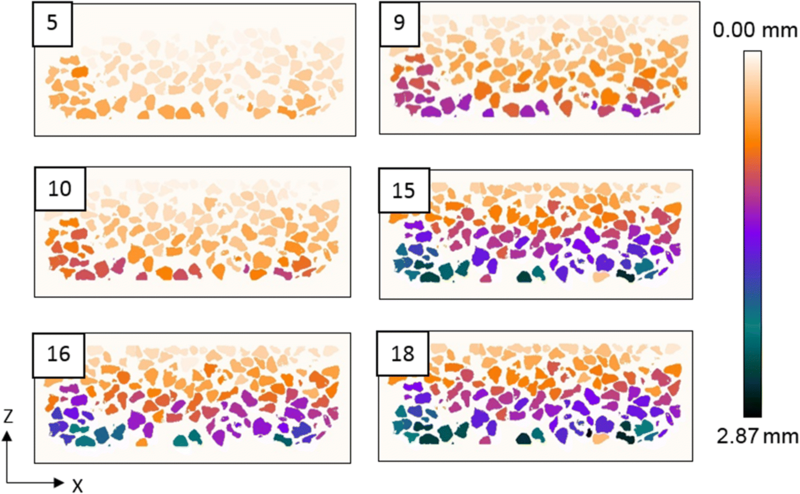 Therefore, in order to better understand the behavior quantitatively, few representative grains were selected from the bottom, middle and top layers of the vertical slice (see Fig. 6a for this) and their movement data over the course of loading is statistically demonstrated. Figure 10 presents this labeled vertical slice showing the chosen grains. Here, grains colored as “red” represent bottom layer, “green” represents middle and “blue” represents top layer. The labeled number represents the index of that particular grain in the sample. Moreover, the quantitative movement information about these grains over the course of loading is presented graphically for the same 6 chosen stress states as presented in the previous section. Figure 11a below presents the data for vertical displacement for the few out of all marked grains in Fig. 10 where the color of trend line resembles with that of the layer it represents. Figure 11b presents the data for 3D grain rotation respecting the color code as used before. Now, it is interesting to see the movement of grains in their respective layers. The vertical displacement is highest in magnitude followed by middle and lastly the top layer. This information was also visible on the color map shown in Fig. 9. However, the plot (see Fig. 11a) provides additional information on the rate of displacement which follows the same trend of being highest for the bottom layer and lowest for the top. Also, the grains in bottom layer show higher heterogeneity in granular movement as presented by the wider range of vertical displacement. The middle and top layer grains, on the other hand, displace rather more homogeneously. In the similar context, the data presented in Fig. 11b for 3D grain rotation show a random behavior for all grains rotating up to 10 degrees during the course of loading; except one-grain index “275” which exceptionally show larger grain rotation. Notably, as all grains show very random behavior for 3D rotation, only a few grains are presented in Fig. 11b for better readability. The almost constant granular rotation can be attributed to parameters like granular packing, coordination numbers, and neighbor count. Also, exceptionally higher values observed for one mentioned grain can be attributed to grain dislocations due to heterogeneity in void space. Subsequently, this kind of information holds the potential to aid standard DE techniques for contact detection, calculation of force-deformation and particle movement. Similarly, the particle movement data for displacement in for X and Y directions has been evaluated from DDIC. Since the test performed was oedometric and therefore as such, no significant statistical information can be withdrawn from these measurements. Nevertheless, the data obtained for X and Y displacements is capable of has the capability to aid the calibration of DEM models and further their statistical representation will be significant for triaxial tests which can be studied in future. In addition, Fig. 11 presents significant analytical information for vertical displacement whereas the trend for 3D rotation was quite random. Hence, we further analyzed the vertical displacement behavior choosing a large number of grains (instead of very few to be representative) for reliable and more promising observations. Four number of vertical levels (X–Y slices) were chosen from the specimen (as shown in Fig. 12, left) to evaluate the average vertical displacement of the grains present in these slices over the course of mechanical loading. The X–Y plane slice in Fig. 12 (right) presents the section of the grains present in those slices in a general context. The top and bottom slices (slice 4 and 1) are 1.94 mm offset from sample extremes and two middle slices (slice 2 and 3) are 3.88mm offset each from slice 4 and 1 toward the center of the sample. The top and bottom offset are chosen to avoid wrong measurements in interfaces because of search window  error (see Sect. 6 for details). 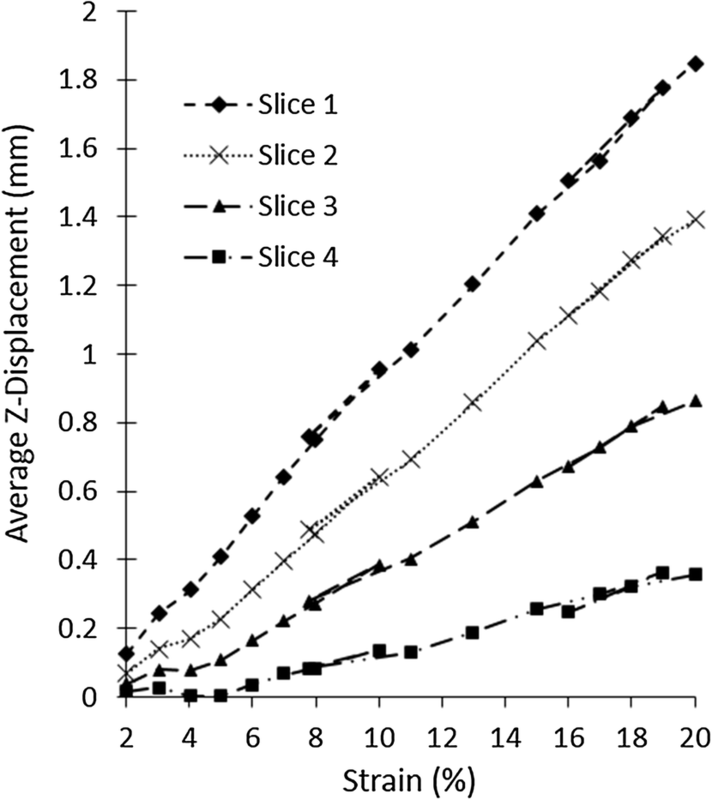 The average vertical displacement was evaluated for the grains present in these 4 slices over the full course of mechanical loading (see Fig. 6b for details). The average vertical displacement map is presented below in Fig. 13. It can be clearly seen that the “slice 1” grains displace more and at the highest rate in comparison with others. This trend is neatly followed by the other three slices with lesser displacement and at a lower rate from “slice 2” to “slice 3” and finally “slice 4.” This trend more rationally justifies the observations presented in Sect. 7 about the theory of stress distribution in granular materials. In addition, the trend is similar to the one presented in Fig. 11a with one major difference of data set, and thus more reliable conclusions can be drawn from Fig. 13. 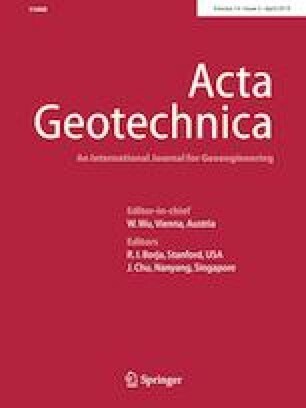 This further indicated the significance of particle tracking information for statistical analysis of mechanical behavior at the particle scale. As a whole, the particle tracking data obtained in this study holds a tremendous amount of information to aid DEM modal calibration, fine-tuning of parameters and to positively describe the macroscopic behavior more rationally and confidently. This potential is also in line with our goal to provide an open-source database for researchers to verify and calibrate their DEM or FEM-DEM models.